The little promotional stickers that advertised 51 Degrees, the solo show back in April, had a website on the reverse pointing to www.schudio.co.uk/51. Visitors to this page would have seen a few different panoramas during the show, but at the moment its the final rendition of the Cubic Experiment. 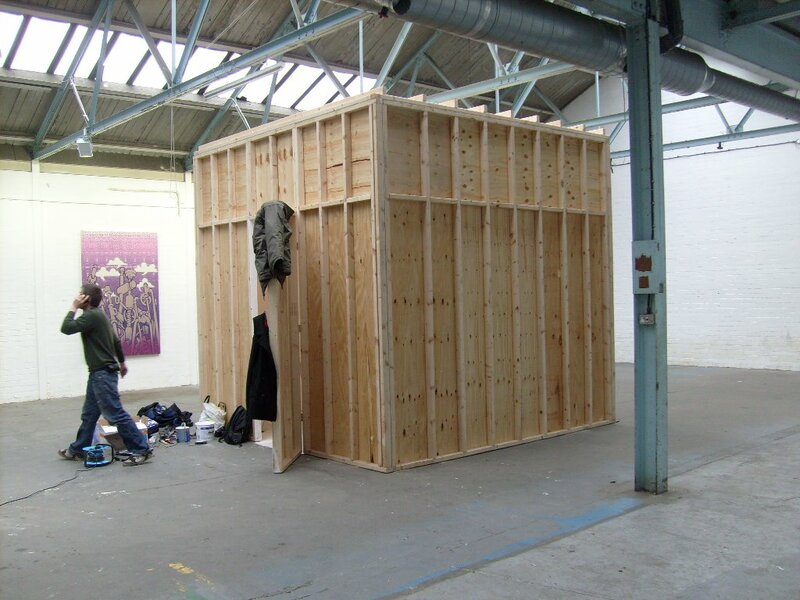 After my group show, Jibbering Art moved the cube outisde. I had to recreate the floor and the ceiling, this gave me a chance to fill up the design a bit more, going for almost complete coverage. 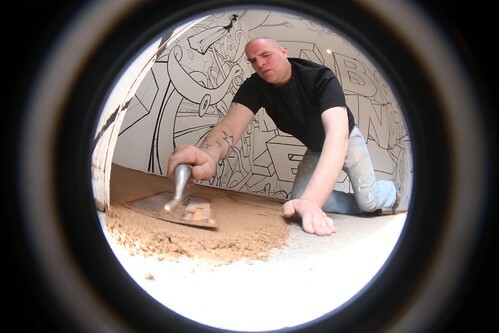 The floor was a large piece of reverse lino that took to the Edding pens really well, and was ably laid down by Big Chris and Jon from Jibbering. Other details were added to the upper walls and some of the ‘rear’ wall, opposite the slogan. The final effect was more than satisfactory and it continued to conceal a few secrets of its own. “The proteiform graph itself is a polyhedron of scripture. profound rainbowl in his (or her) occiput.— James Joyce, Finnegans Wake pg. 107. Logic Alphabet models by Shea Zellweger. In 1953, while working a hotel switchboard, Shea Zellweger began a journey that would culminate in a radical new notation for formal logic, the set of relations that underlies modern computing. From a garage in Ohio, Zellweger developed a visual language he dubbed the “Logic Alphabet,” in which a group of specially designed letter-shapes are maneuvered like puzzles to reveal the geometric patterns hidden beneath the symbolic web of logic. For more than fifty years, Zellweger has been exploring the symmetries and relations inherent in these patterns, which he has made manifest in a series of delicately crafted wooden models and in thousands of pages of diagrams. 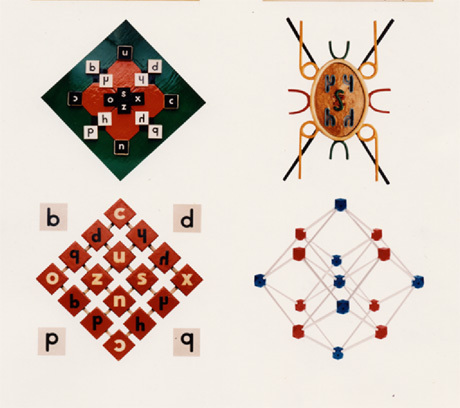 In this jewel-box exhibit, the Institute For Figuring and the Museum of Jurassic Technology proudly present Dr Shea Zellweger’s Logic Alphabet models and drawings. 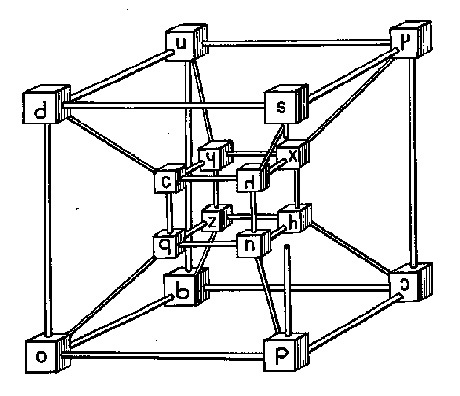 The Logic Alphabet Tesseract – a four-dimensional cube. Diagrams by Warren Tschantz. reminiscent of Russian Constructivism, concrete poetry and Pop Art. What is most important here is that these physical models enable us manipulate logical symbols spatially – we may learn to do logic by flipping and rotating these marvelous toys. 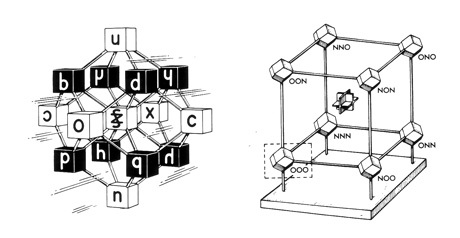 Left: The Logical Garnet, three dimensional projection of the Logic Alphabet tesseract. Right: A cubic sub-group of the Logical Garnet. 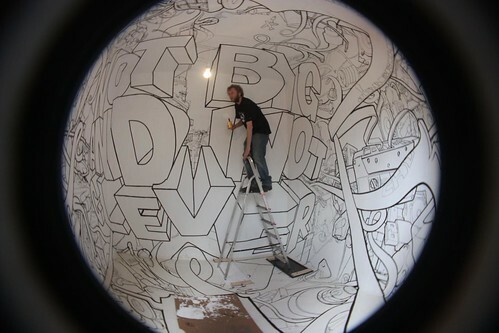 GRAFFITI ART AND STREET ART ARE REVOLUTIONIZING ALPHABET AND COMPUTERS – WAKE UP TO THE WRITING ON THE WALL. This entry was posted in Alfred Korzybski, Chu, cube, Friedrich Froebel, Hyperbolic, Saul Paul Sirag, Shea Zellweger. Bookmark the permalink.